JENN: Did you run at all last week? JENN: Hey, if you're running a lot, that makes total sense. Protein is good! JENN: Fish and eggs, fish and eggs. MOON: Eggs... now I want to eat eggs. How was your week?! How was your ballet?! JENN: Oh, it was... fine. This was basically my least favorite show ever (the ballet performance, not Silicon Valley, which is AWESOME), but nothing terrible happened. I just wasn't happy with it - in fact, I uninvited my dad AND boyfriend. But: it's over!!! :D I have my weekends back and everything! I was mostly at rehearsal all week, but I did sneak in one 9 mile run on Tuesday. That was all this week. Hoping to bring fresh legs to a couple (gulp) RUNS OUTSIDE. MOON: Haha, I should do that too. JENN: It's the WORST. But it's also good for my body and good for my running ability, so here we are. Summertime is GET UP EARLY AND GO RUN OUTDOORS time. MOON: I've been in a pretty awful mood this past week, so anytime an outside run crossed my mind it was either 1. Too late (Thank the gods the curfew in Baltimore city is over. That was... bleh); 2. Cold; 3. Humid. Sooooo, not off to a good start. Do you have a good trail to run? 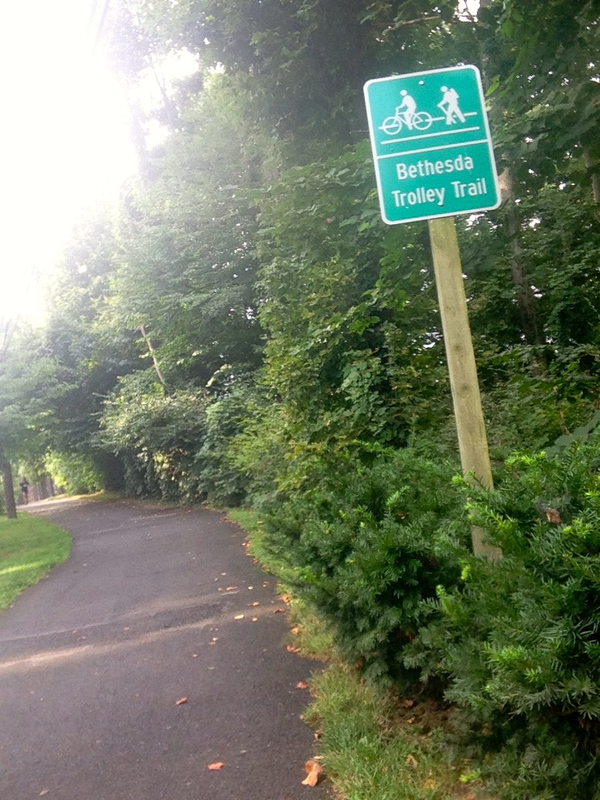 JENN: Pretty decent - I use the Bethesda Trolley Trail, which is still the most easily accessible trail for me even from my new apartment; I just come at it from a different entry point now. It's got moments of serious incline which, again, I HATE, but I know it's good for me and makes comparatively flat race courses feel much better. In short, I recognize the virtues of the outdoor run - I just like to whine about it. MOON: Ha, I could say the same. JENN: Also good for you, no whining required? The roundup! - Fairytales and Fitness expresses the marathon mentality perfectly. - We Run Disney is all about race day! - Pink Elephant on Parade considers running-related purchases. - For those dipping their toes into tris, Elbowglitter has the skinny(dip?) on open water swims. - Mom's Magical Miles talks about the blogging experience. - Home is Where the Mouse Is has compiled a list of the top ten snacks in the Magic Kingdom. Thank you for sharing our post on the 10 Best Magic Kingdom snacks in your round up. Would you mind changing the description to our blog name, Home is Where the Mouse is? We'd really appreciate it. Thanks again for sharing. Sorry about that! Got mixed up, clearly. Should be all set now!